At Greg Coleman Law, we take pride in our ability to attain compensation for those involved in personal injury. Our experienced staff of personal injury lawyers are here to protect those hurt in the state of Tennessee, especially Knoxville. Below are some of our videos that prove how serious we are about getting you the justice you deserve. For help with your injury lawsuit, speak with one of our attorneys today by calling (865) 247-0080. Knoxville personal injury lawyer Mr. Gregory Coleman from Greg Coleman Law provides important information for victims of a personal injury accident to consider once the accident has taken place. Have you been injured in an accident that you did not cause? If so, contact Mr Coleman today at 1-800-HURT-NOW. If you or someone you love has suffered an injury from a car accident that was caused by another motorist, contact the law offices of Greg Coleman Law today at 1-800-HURT-NOW. We offer 100% FREE case evaluations and we only get paid when our clients receive compensation for their claims. Text: Have you or someone you love been injured in an accident? Contact the team of attorneys at Greg Coleman Law today at 1-800-HURT-NOW. If you are unable to meet in our offices, we will come to you to discuss the merits of your personal injury claim. 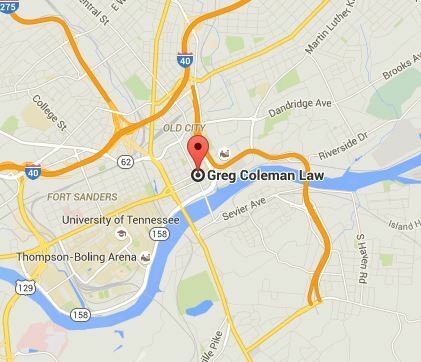 Greg Coleman is an AV Rated attorney based in Knoxville, TN. If you or someone you love has suffered a serious personal injury that was caused by another individual or as a result of a defective or dangerous product, contact his law firm today at 1-800-HURT-NOW. At the law offices of Greg Coleman Law, we are dedicated to fighting for the rights of injured workers throughout Tennessee. Contact us today at 1-800-HURT-NOW to find out how we can help with your compensation claim. Have you had your Social Security Disability benefits cancelled or your application rejected? Contact Greg Coleman Law today at 1-800-HURT-NOW. We offer 100% FREE assessments to review your case and can help to fight for the justice that you deserve. In this video, Knoxville automotive accident attorney, Mr Gregory Coleman discusses three very important tips for victims of auto accidents to consider. If you or someone you love has suffered an injury in a car accident that was caused by another driver, contact Greg at 1-800-HURT-NOW to discuss your legal options.